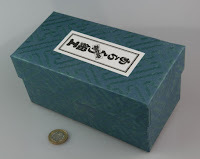 Nonsense Box – the cherry wood one – is named after the fact that it is thoroughly useless as a box… from the devious mind of Nob Yoshigahara it displays his sense of humour rather neatly… why would anyone ever decide to design a box that was thoroughly useless?! I can however tell you that they rattle, a lot – there are a lot of pins inside there, and they’re big – a lot bigger than I thought they were from their pictures! Despite their age (over 30 years now!) 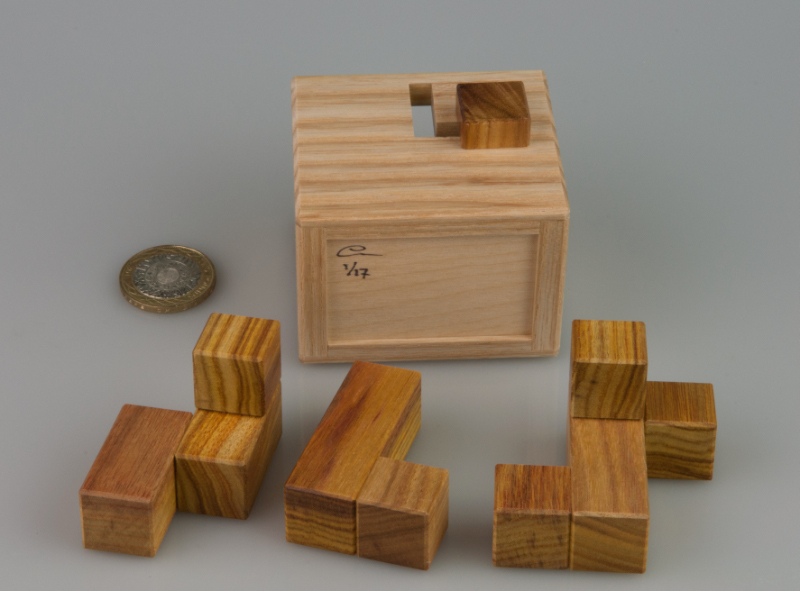 they still operate perfectly – serious props to Kamei-san! 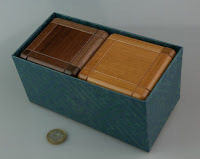 … funny thing is, that I find a lot of puzzlers don’t stop to enjoy the joke – open the first box, close it up. Open the second box and close it up. Then move on to something else… without stopping to think about the obvious pairing, their differences and where the name comes from… pity that. 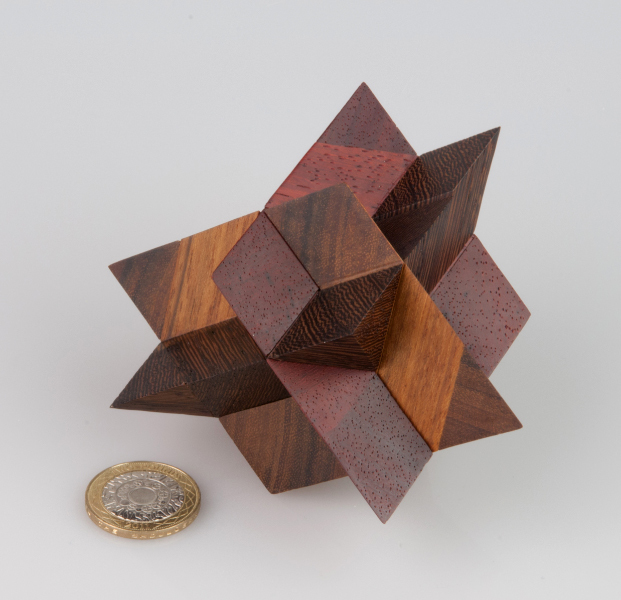 Q: What do you get when an incredibly talented craftsman takes three pyramids with rhombic bases and mashes them together? 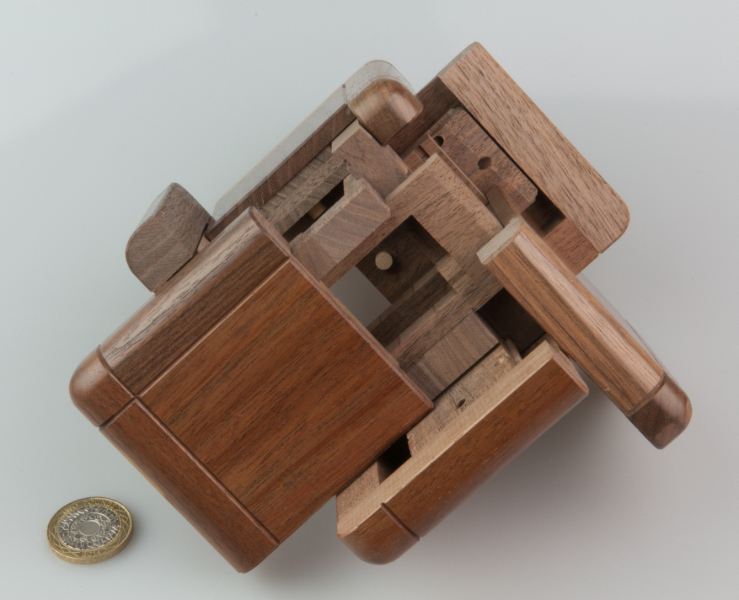 …and when the craftsman concerned is Mike Toulouzas, a rather tricky puzzle as well. 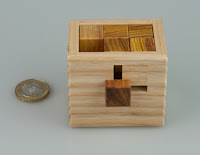 Mike’s website has a list of the puzzles he’s produced with glorious photographs of all of them – and a little background about each design. Those photographs can produce a great deal of puzzle lust if you happen to be prone to such things – you’ve been warned! 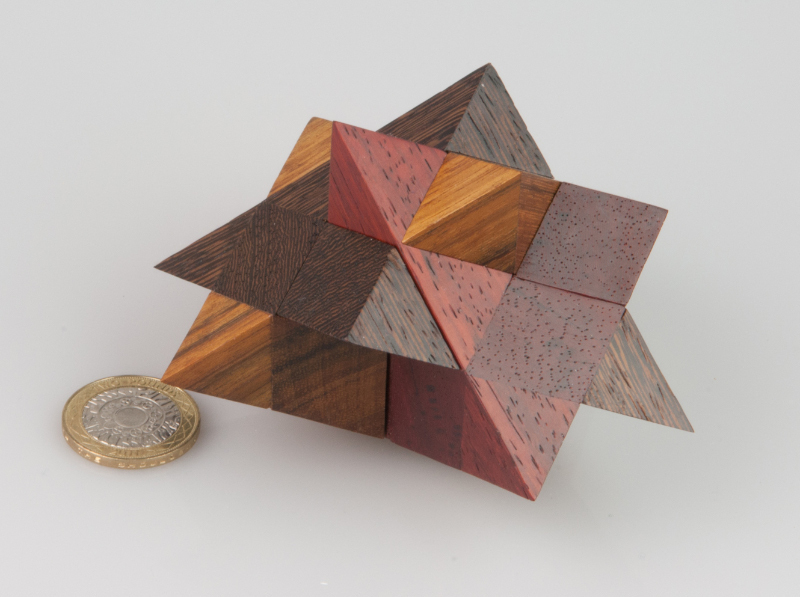 Unfortunately, I am prone to such feelings and as a result I generally find myself keeping an eye out for Mike’s stuff on auctions and in private conversations about puzzles potentially for sale… and a little while back someone rather generously offered to sell me a copy of the Triple Rhombic Pyramid puzzle – I didn’t need to spend very long in thought… and it’s duly been road-tested by a number of MPP-irregulars – all of whom have pronounced it a great puzzle. 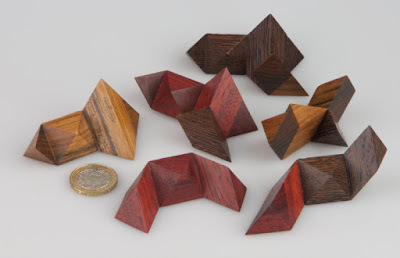 Now Mike’s notes on this one point out that using different woods for the three pyramids should help a puzzler – and they probably do, but in my experience, they generally provide a really good confirmation that you’re doing the right thing, but they definitely don’t lead you toward the right thing initially! 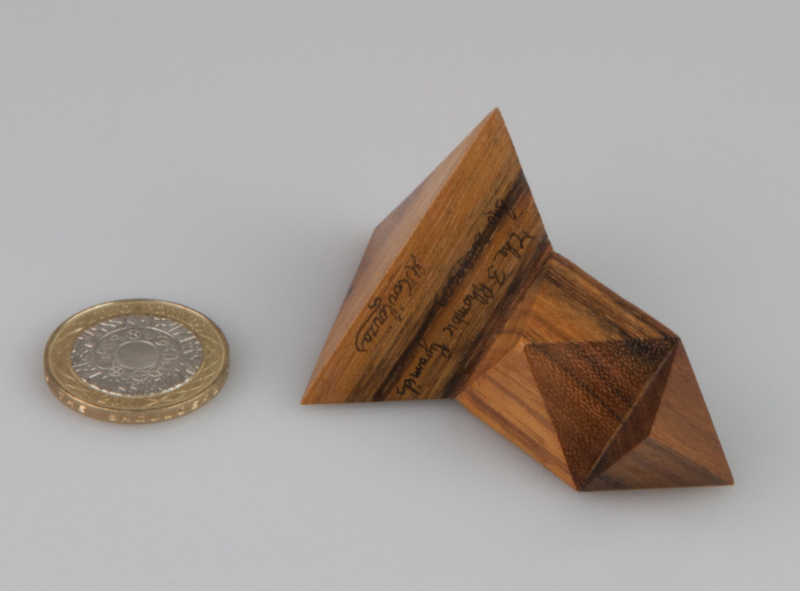 The angles on the pyramids, and those pesky internals do a right good job of not narrowing down the potential places for various bits to go – just working out how to make the three pyramids on their own is a challenge – remember there are bits missing where they intersect and it’s not always clear where you want the holes to be… then trying to work out how they should combine isn’t too much of a bother, but the final step of working out how to get the right bits together in the right order, provides a classic Coffin-esque puzzle. It’s not only a good puzzle, but a stunningly beautiful object… another Toulouzas triumph. This was one of my favourite puzzles from Eric’s February batch of goodies. 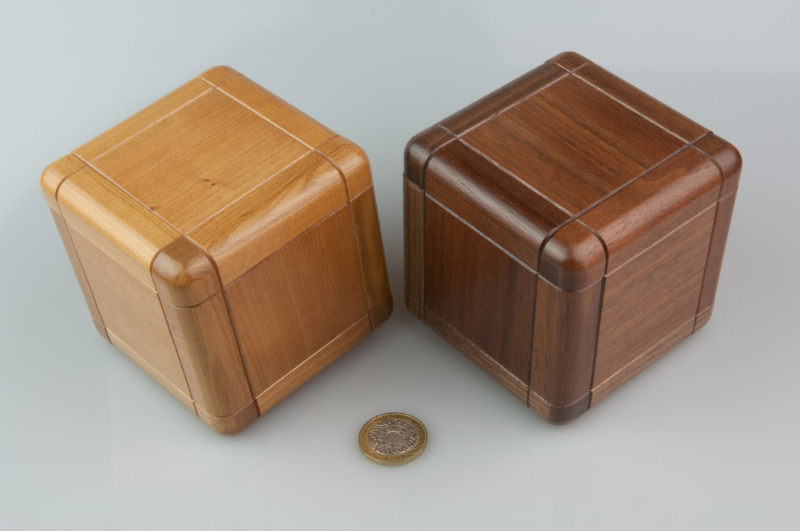 The pieces between them take up 15 cubies, plus the one attached to the box, which leaves a practically cavernous 2 cubie space left after you’re finished… should be simple! Eh, naw… as it turns out it’s a tricky little number that requires the puzzlists to first find an assembly that should work, then exhaust all the possible ways of getting it into that little constrained box… and of course that little constraint is massively limiting. 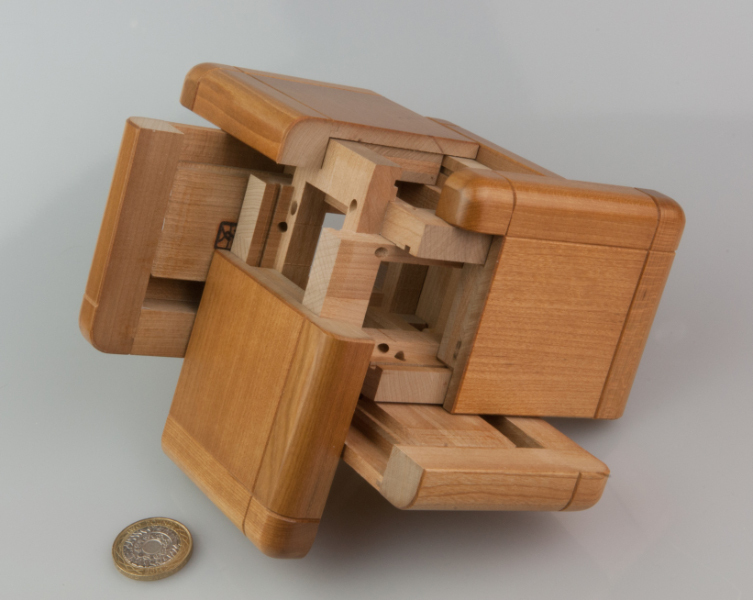 You might for instance find that there were only two possible assemblies, and then discover that the moving cubie in the box reduced that to a single solution, requiring a little bit of manoeuvring to achieve the proper solution.